Are you searching Free IPL Live streaming website or Apps on Google? Do you want to watch IPL 2019 in HD crystal clear picture quality? And you have come across either a paid or fake website. Then you don’t need to hunt anything like that. Being an IPL fan I have something for you to watch IPL free without any subscription on PC as well as Android Phone. I know there is a vast number of people who love to watch IPL on their mobile as it’s very convenient. You don’t need to pay for Hotstar subscription or watch a 5 min delay game. Everything is true live even in HD quality. First I am going to discuss Android app through which you can watch free IPL 2019 live streaming in HD quality no lag no delay. All these apps are free to download and free to use. No membership no subscription. Just download install and watch IPL 2019 on your mobile on the go. HD Streamz is the best android app to watch free IPL 2019 live streaming in HD quality on your mobile phone. Just download and install the apk file. Open the app. On the very first home screen, you will many IPL options. Tap on it and play via MX player or any other player and enjoy. Sometime it may show server problem then you just need to tap on next IPL buttons. This is a trial and error process but something that you would not regret to do at free of cost. There are many websites available in the internet to watch IPL 2019 live streaming free. But this bellow enlisted website works like a gem. The best part is you can watch in Full HD quality. You just need to switch to 4K. Though here it is said or mentioned as 4K but it is not 4K. Moreover Star Sports Select 1 does not have 4K channel. It is only HD. The picture quality is awesome. If you desktop or Laptop and you want to enjoy IPL 2019 there then this is the best site to watch IPL 2019 live Streaming free in HD. So you can enjoy IPL 2019 in HD on your mobile or PC without any delay or paid subscription. 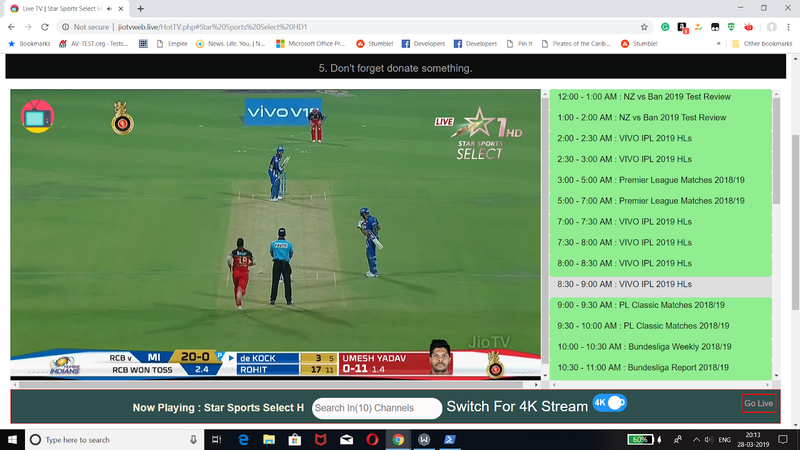 In case if you have some these type awesome app or website to watch IPL 20019 live streaming free in HD quality then kindly comment here. I will update it.